Do you want to improve your radio skills? Or thinking about a career in radio? 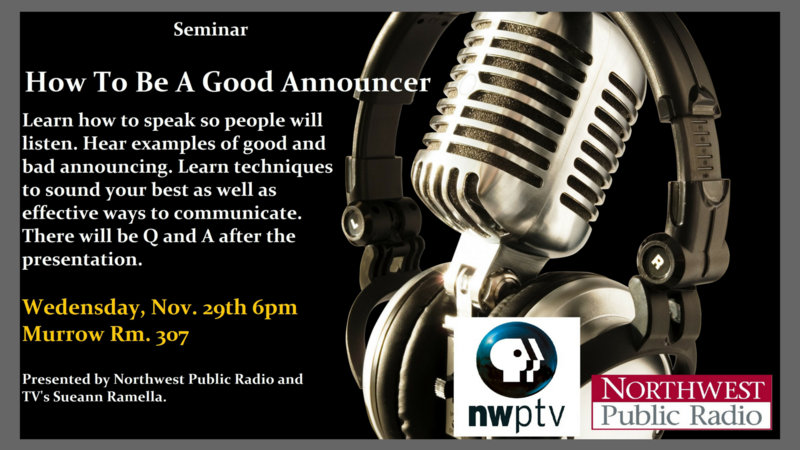 Then join us this Wednesday, Nov. 29, at 6 p.m. in Murrow Hall 307 for a seminar on Announcing 101. Our esteemed hosting will be Sueann Ramella. Sueann has 20 years of experience with NWPR/NWPTV. In 2000 she became the host of All Things Considered, and then in 2008 switched to hosting Morning Edition. 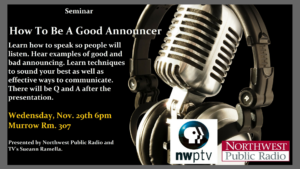 Sueann will be teaching about how to speak so people will listen. The event is open to all students. Even if you have no announcing experience this is a great place to get started. Any and all donations are greatly appreciated! 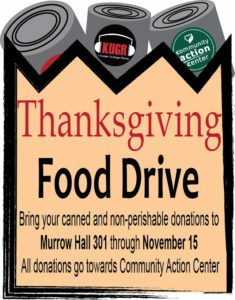 There are three locations you can bring donations. 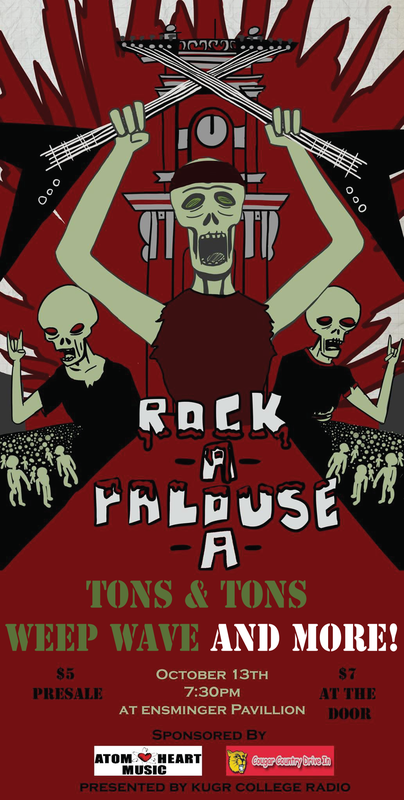 Pullman Dissmores: Friday November 10, 11 a.m. – 5 p.m.
Join us as we present our second annual Rock a’ Palouse a’! 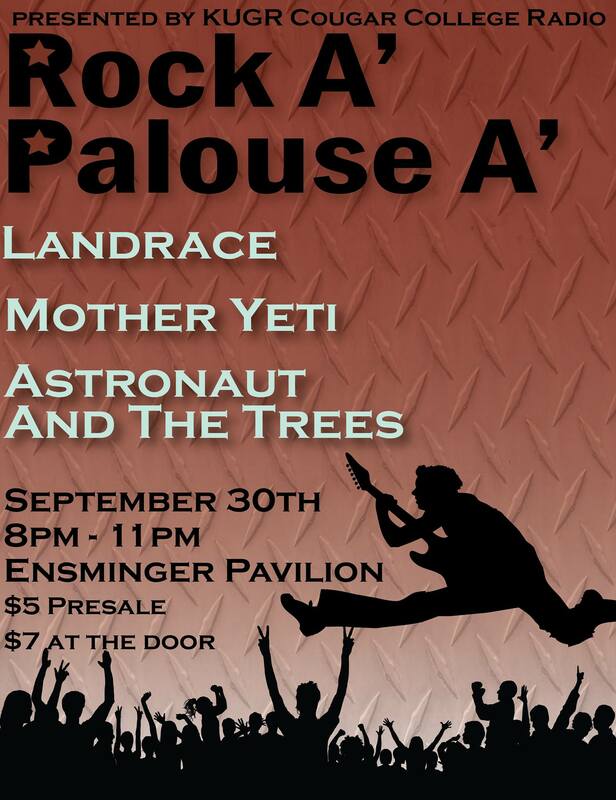 This year’s Rock a’ Palouse a’ will take place Friday October 13, 7:30 p.m. – 11:00 p.m., in Ensminger Pavilion. There is a style of music everyone can enjoy and it is open to the public. The event is geared towards featuring underground artists from the Pullman-Moscow area as well as from across Washington. Artists include Landrace, Tons & Tons, and WEEP WAVE. 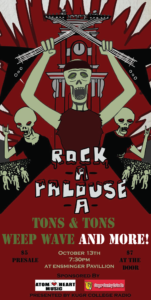 Tons & Tons are a rock band also based out of Pullman, Washington. They have an eclectic sound mixing the styles of Coldplay and Guns ‘n’ Roses. WEEP WAVE are DIY darlings out of Seattle, Washington. Their music can be classified as underground garage rock. Those who like Modest Mouse will love the loud instrumentation decorated with synth and distortion. Not only will there be Tons & Tons and WEEP WAVE, but there are more bands to come! Tickets are $5 presale and $7 at the door. 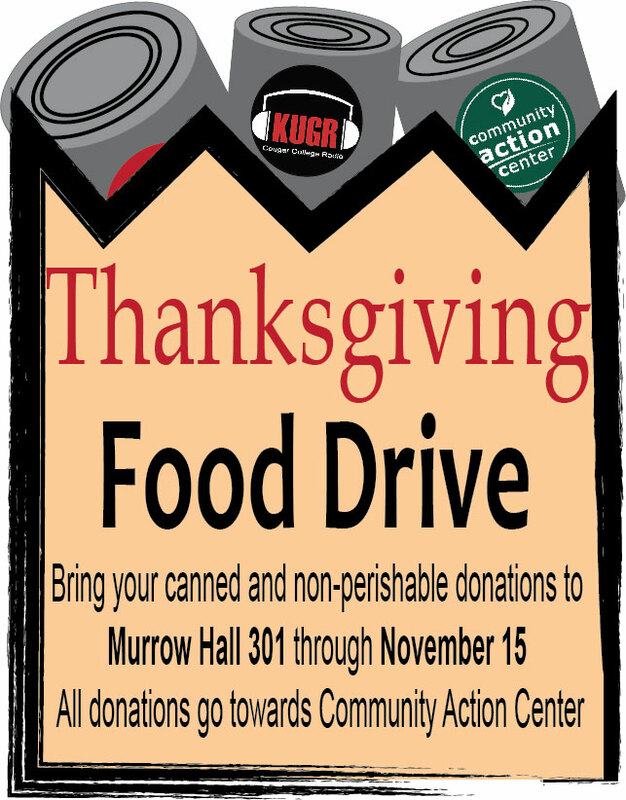 Presale tickets can be purchased at the KUGR table in the WSU Compton Union Building or in their office located in Murrow Hall 301 Pullman, Washington. Special thanks to the Rock a’ Palouse a’ sponsors, Atom Heart Music and Cougar Country. Hello from the 2016-2017 Board of Directors! Last Spring, 75% of our previous Board graduated from the University and moved on from the station to start their careers. In the fall, we found ourselves under new management with several bright, new faces ready to continue the legacy of the graduating Class of 2016. The 2016-2017 Board of Directors had many accomplishments this fall. 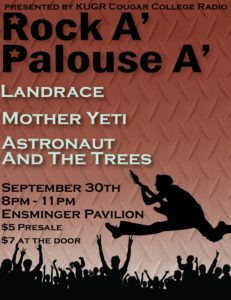 At the beginning of the semester, the directors worked together to create the first concert for the station in years, called “Rock a’ Palouse a'”. The concert was a big hit and a wonderful start for the new semester. It was followed by the “Witchin’ Costume Contest” and the annual Pong Tournament, featuring a prize football signed by the entire WSU Football Team! The Sports Department had a successful season of broadcasts in Volleyball, Soccer, Basketball, and Football. In the beginning of the year, they hosted a Q&A with KUGR alum Art Eckman, who gave them tips to improve their broadcasts. The Department is looking to continue these types of events this Spring, which are open to all students at the University. A few members of the Board even got the chance to return to the CBI Conference for the second year in a row. Music Director Ellen Gordon, Production Director Jonah Markwith, and Fundraising Director Katherine Barner were able to travel to Philadelphia to attend conferences about college radio, bringing us back a lot of exciting new information. Many new changes to come soon! We are excited to show you a new face of KUGR College Radio. We started a new-ish process for hiring DJs this semester, which included a new interview process! The Board of Directors had a chance to hear from DJs about their shows, and offered advice for show structure and social media promotions. We hired four new assistant directors: Katherine Barner, Eduardo Ramos, Spencer Anderson, and Alejandra Martinez. February 7th is the first day of shows! Fundraising committee is putting on our first “Smooch A Pooch” event on Feb. 17th! This is the last week of mandatory student shows, so please support our DJs and listen in! Here are a few updates about the station. Our student shows are going strong, and our new DJs are showing growth and progress within the last few weeks. IT installed new computers in the studio. The new automation system should be installed over Thanksgiving break. We have reached over 200 listeners in a single day on TuneIn. Loud Speaker Lunch Hour has been a major success so far, and we’ve had people call in for requests. Production and Fundraising committees have had their first meetings. We received our promo items! We set the goal for 1000 facebook likes by December 18th. Have a safe break everyone and thanks for tuning in! DJs started their shows on Wednesday Oct. 14th, so check out the show tab to see who is on and when. 2. We have finally received our new equipment and automation software, but we are still waiting on installation. 3. We raised $296.24 for Band of Brothers Northwest. 4. We started Loud Speaker Lunch Hour on Fridays from 12pm-1pm, where we crank up the tunes and students can hear us outside! 5. We have four members of the board going to this year’s CBI convention in Minneapolis, MN next week! 6. We were approved to giveaway tickets to concerts at the Knitting Factory in Spokane, WA. KUGR RADIO IS BACK BABY!